Seven Oaks Ooops... or a suburban legend? The street in the Seven Oaks subdivision named Ozem Gardner Way would have been, could have been... named Laurel Oak Drive if the house movers had not dropped the house and broke it? Seven Oaks Ooops... or an urban legend? True? Not that I doubt Resident... but I have been told some great stories and passed them on... later I found they were not true. The story of President Lincoln ... Abe? I wrote about that story somewhere. It was a classic Abraham Lincoln slept here story. The story was about the north Columbus streets, Chase. Lincoln, Stanton. An agent in my office told me Lincoln stayed at a farm on Lincoln Rd. when he visited Central Ohio. Then there was the story I told my whole two or three hour stint on Clintonville Homes Tour one year... when the seller came home I found out the person the shift before me... made it up? Heard it from someone else? I am sure MI Homes developed Seven Oaks, did MI Homes hire house movers that dropped the house? Seven Oaks is a city of Columbus neighborhood, in the Worthington City School District with a Westerville mailing address. It is in a very, very suburban area just south of the Delaware County. Do you know where the big Chase Bank facility in the Polaris Area is? Seven Oaks is just south of that. Seven Oaks is just east of the railroad tracks. Just south of Seven Oaks is the Flint Carryout. The Flint area has a very interesting history. Can anyone verify this story? Did movers drop Ozem Gardner's house? Worthington's Seven Oak's this day in history was about the history of Flint's Ozem Gardner. Worthington Memory identifies the brick house on the west side of Flint Rd with the big front porch as Ozem Gardner's house. Or I believe that is the house on the west side of Flint Road with the big ole front porch. 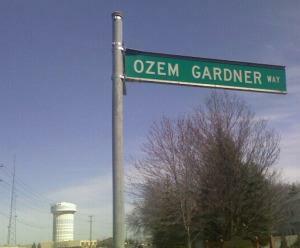 I could not have told you that was Ozem Gardner's house before I looked today. Isn't there a house with a porch on the east side of Flint road too? That house sold real loooooow within the last couple of years. Maybe that's the house that got dropped? Seven Oaks is a City of Coumbus neighborhood in the Worthington City School District. Seven Oaks has a Westerville mailing address just to make things more complicated? No just because that's the way it is. Flint was a historic Central Ohio Village nearby this subdivision in northern Franklin County. Seven Oaks Ooops… or a suburban legend?